All my Ridgeway walks have been on open chalk down-land, with far reaching views. Not this one! I parked the car in a very convenient little car park next to Nuffield church. Nuffield is a small village on the other side of the ‘Goring Gap’ from where I was staying. It was also the only walk where I set off in the ‘wrong’ direction. In other words, walking westwards, the opposite way to the Trail Guide. The trail starts going down a field edge heading south, and then takes a right angle bend west. That is the point I was at in the photo above. No chalk tracks. No wide views. Lots of trees. And Grim’s Ditch running alongside. This is a deep, wide depression which was probably constructed sometime in the Iron Age, although quite why is not really known. 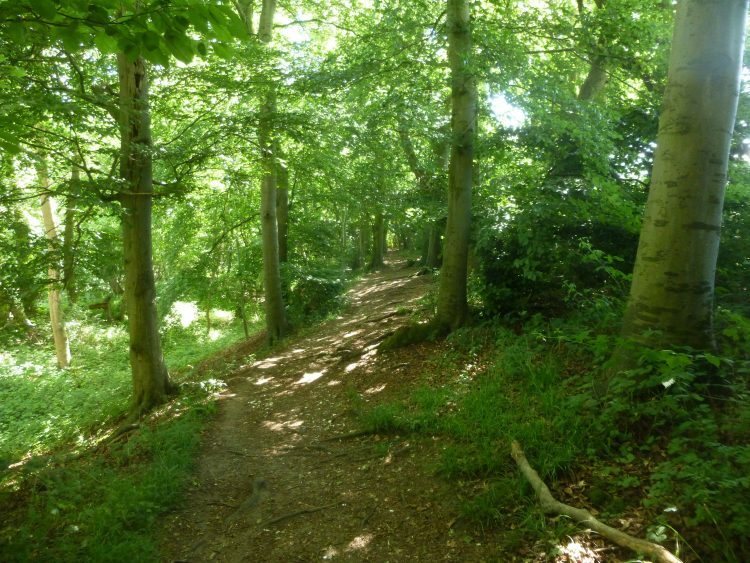 It runs for 5 miles from the bank of the Thames to the foot of the Chilterns. 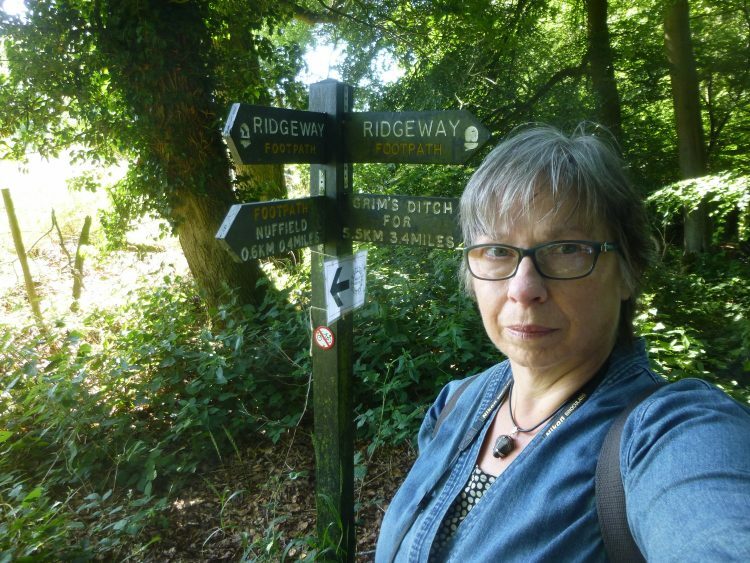 As can be seen on the sign in the photo, the Ridgeway runs beside it for 3.4 miles. Twice the path crossed from one side of the ditch to the other. Grim’s Ditch can be seen clearly on the left of the photo above. The trees are mostly beech and ash, with some elder and hawthorn as an understory. Red campions and buttercups flowered in the brighter places, and the sunshine splashed down through the trees in streaks and patches on the path. The path meandered up and down slopes, and the tree roots spread out across the path in the thin chalky soil. In places it was hard to walk for stepping over them. In another stretch the path ran through a depression with beech trees on both sides, and I was walking through deep leaf litter, built up over years, with the reddish tinge from the fallen beech leaves. I had seen red kites above the church yard as I parked the car, and kept seeing them above the neighbouring fields. I could hear their thin wavering call even when I couldn’t see them. This was actually the last walk that I did. The previous day I walked up Ivinghoe Beacon at the very end of the Ridgeway. But to make it make sense I have written these posts in geographical order, not the order that I did them. SO this was my last Ridgeway walk of 2018, and I had pretty much decided that I wouldn’t be returning again to do any of the remaining stretches. As I turned round and began to retrace my steps, I thought what little magical thing could happen to finish off my Ridgeway walks. And I decided it would be quite magical to find a red kite’s feather. I had only a short distance left to go. The path was along the edge of a field. I rounded a tree. And there it was. A beautiful red kite’s feather, 14 inches long, with the white flight feather edge, and the reddish brown bars. It was in perfect condition and was lying on top of the undergrowth as if just dropped. It certainly hadn’t been there when I walked past earlier that morning. What a lovely find – and a magical end to my Ridgeway walks.